Florida maybe a great place to live for a lot of what I like to do but in the summer it is really just BRUTAL to run. Or do anything outside other than SCUBA diving. I’ve done midnight races that were in the 80s. There is not a ‘cool’ time of day to run but there are times that are cooler. Basically from 4 – 8 am, you can get mid to upper 70s on most days. Past 7:30 am and that is when the temps really start to skyrocket. If I could get a whole run in before 8 that would be great but since I can’t consistently wake up daily at 4am for longer weekday runs, I may get part of the run in before 8 but not all of it. Today is a good example. I’ve been increasing my weekly mileage over the past 5 or 6 weeks and I’m at the point where some of my weekday runs have gotten a little long. I’ve always considered 6 miles the cutoff between a reasonable length and going long. 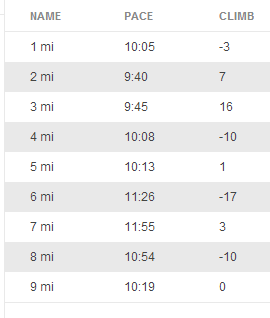 I rarely run 7 miles so that generally means if I’m doing more than 6 its 8-10 miles. I’m not fast though so running 8 miles in the morning is going to take me well over an hour. That’s where it gets hard. In the winter, I could easily rock a 9 minute mile for 8 miles. Ok, not easily, but I could do it. That gets me done in 1:12 or so. Not in the summer. Today’s run took 1:24. That makes a big difference in the heat! My goal is usually to get get out of bed at 6am and to Starbucks by 6:20. That way I can have my coffee and be on the road by 6:30. If I pull that off, even for a longer run, I’ll be done by 8am and miss most of the heat. Not going to lie though…I don’t accomplish that very often. So for the summer I just do what I can. My goal on a run is almost always a reverse split. What that means is my second half of the run is faster than the first. The problem is the heat affects me so severely that it is very hard for me to accomplish that during the summer. Definitely started to struggle in mile 6! Today I decided I wasn’t even going to try. Result? Today I ran the first 4 miles in about a 9:50 min/mile pace. But the final pace of my run was 10:30 so obviously the second half was much slower. I’ve decided if I want to get faster, at least until it gets cooler, I’m just going to have to push myself harder in the first half than I can in the 2nd. When I run on the treadmill its a different story since its a little cooler inside but when the temps soar into the 80s I just can’t go much faster. I actually felt a little nauseous today around mile 7 so I know I was going as hard as I could. I also ran out of water so I’ll have to start carrying more than 20 oz of water on me.